Gorgeous waterfront 3BR brick home makes entertaining easy. Open floor plan has plenty of windows for natural light & great views throughout. Custom kitchen cabinets and top appliances. Master walk-in closets, vanity area, custom shower and jetted tub. Beautiful Mill Pond views from your patio. Attached 2.5 car insulated garage & work shop. Industrial grade metal roof. Wide stairs from garage to basement to move all your large items. Separate garage for the toys. 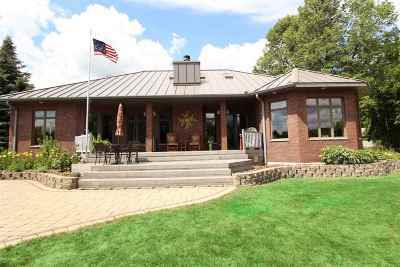 Paved drive makes the whole place shine as you drive up to this impressive property. Must see to appreciate! Directions: From Westfield Go South On Main To West On 4th (Cty Rd E) To First Left On S Market St.